McClure sixth graders Maya Jackson and Maile Anderson with their favorite teacher, Bonnie Powers. 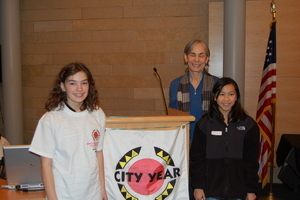 Queen Anne News, January 23, 2008 - City Year of Seattle/King County announced the winners of their Martin Luther King Jr. "If Not Now, When?" essay contest on Jan. 19, with students from McClure Middle School sweeping the three top honors. Maya Jackson's essay was awarded first place, followed by Maile Anderson and Phillip Kiefer. All three sixth-graders were judged against a city-wide field of sixth-, seventh- and eighth-grade students. McClure language arts teacher Bonnie Powers, a mentor to the trio of award winners, was on hand Jan. 19 to witness two of her pupils accept their awards at a ceremony at Seattle City Hall. Kiefer and Anderson received plaques and certificates, after which Jackson took the podium to read her essay. The audience enthusiastically applauded her speech, which incorporated messages of peace, service and equality in honor of Rev. King. City Year's celebration kicked off their MLK Seven Days of Service as well as serving as the opening ceremony for Young Heroes, a program that engages middle-school students in volunteer service. Jackson, a first-year Young Hero, joined 75 of her peers in vowing to dedicate five months of Saturdays to the program. By the program's graduation ceremony in May, each young person will have completed at least 100 hours of service, and will receive the President's Volunteer Service Award. To learn more about City Year and Young Heroes, visit www.cityyear.org. The online version of this story can be found here.